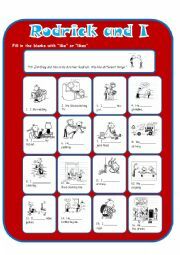 A worksheet for practicing the third person singular with Greg and Rodrick Heffly. Fill in the blanks with "like" or "likes". 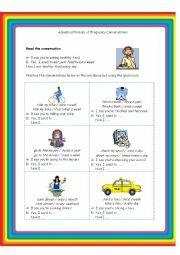 Worksheet for practicing frequency adverbs. Read the sentence and fill in the blanks with what´s true for you. This is a go fish game for practicing the phrase "HAVE YOU BEEN..." Full set of cards and instructions included. 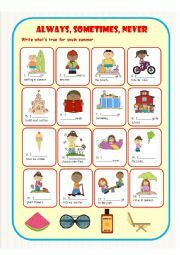 Go fish game for learning personality vocabulary. 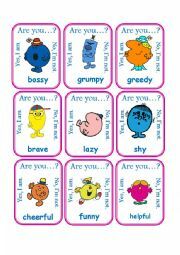 I used images from Mr. Men and Little Miss which are so helpful in learning these kinds of words. Full set of cards plus instructions included. 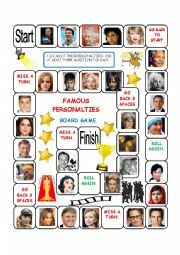 A board game for practicing personality vocabulary. Land on a space and say three adjectives describing that person. If your students don´t recognize these celebrities, feel free to change the photos. THANKS PHILIP R FOR THIS TEMPLATE! 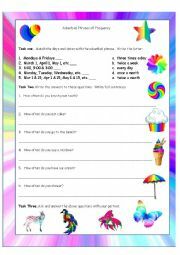 This worksheet has two exercises: a matching exercise (with key) and a sentence writing exercise. 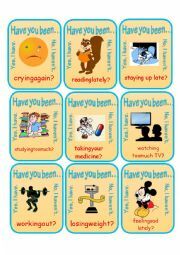 It´s for learning to use adveribal phrases of time (every day, once a month, twice a week, etc.). 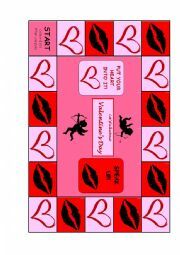 I am also uploading a board game and conversation card for this grammar item. Hope it´s useful for you. 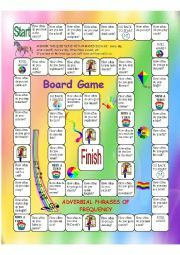 This is a board game for practicing adverbial phrases of time (every day, once a month, etc.) 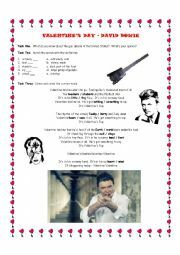 I´m also uploading a tutorial worksheet and a speaking practice for this grammar item. Hope you enjoy this. THANKS PHILIP R FOR THIS TEMPLATE! This is a game inspired by those I´ve seen on teachingtruffles.com. File includes board game, 2 sets of cards, fake money and instructions. Enjoy! Another unromantic contribution for Valentine´s Day. Listen to Bowie´s anti-gun song and circle the correct word. I am linking this song to a reading on the Saint Valentine´s Day massacre. Key included.